Former astronaut John Glenn, the first American to orbit Earth, has died at 95. The ex-Marine and US Senator had been in hospital in Columbus, Ohio, for more than a week and died surrounded by his children and wife of 73 years. 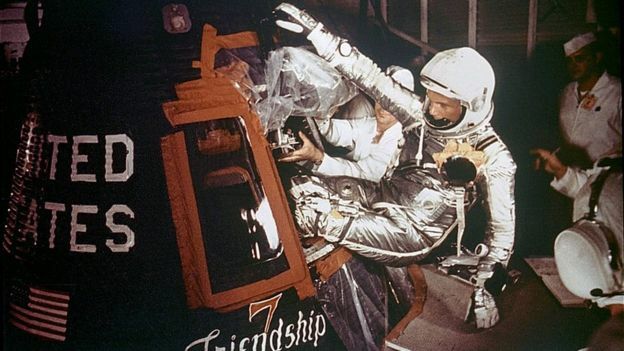 Glenn is best known for circling the earth in 1962 aboard a space capsule dubbed Friendship 7. He was credited with restoring US pride after the Soviet Union took an early lead in manned space exploration. Glenn is expected to be buried at Arlington National Cemetery, Virginia. “Though he soared deep into space and to the heights of Capitol Hill, his heart never strayed from his steadfast Ohio roots. Godspeed, John Glenn!” Ohio Governor John Kasich said in a statement. Upon returning to Earth, Glenn served the US Senate as a Democrat for 25 years. But he once again defied gravity, as well as age, in 1998 – 36 years after his historic flight – when he became the oldest man to travel to space at age 77. The only son of a plumber and schoolteacher, Glenn was born in 1921 in New Concord, Ohio. He became a combat pilot, serving in World War II and the Korean War before joining America’s space agency. After setting the transcontinental flight speed record as a test pilot, he joined Mercury 7, America’s first class of astronauts. On 20 February 1962, he blasted off from a Cape Canaveral launch pad aboard a cramped capsule on an Atlas rocket to a new frontier for Americans. He spent four hours, 55 minutes and 23 seconds in space, completing three laps around the world. 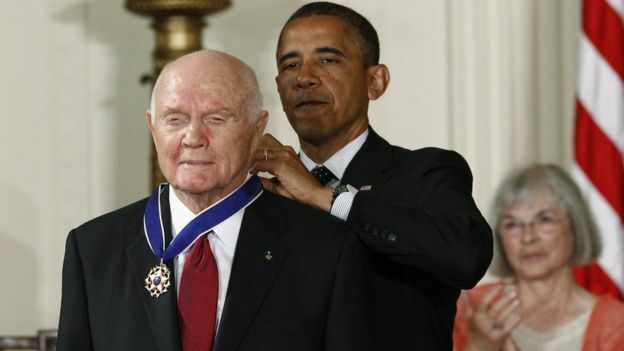 In 2011, Glenn received the Congressional Gold Medal, the nation’s highest civilian award. A year later, President Barack Obama presented him with the Presidential Medal of Freedom. Also reacting to news of Glenn’s death, Nasa tweeted that he was “a true American hero”. “Godspeed, John Glenn. Ad astra”, it added, with a Latin phrase that means, “to the stars”. ← 4 Ways To Keep Drama Out of Your Life for GOOD!